As I have mentioned in several other recent reviews, the Richmond area is currently producing 18 plays by 16 theaters as a part of the Acts of Faith Festival. 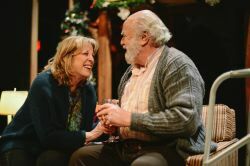 With so many shows, I almost missed Cadence Theatre Company in partnership with the Virginia Repertory Theatre’s production of Stephen Karam’s Sons of the Prophet. Thankfully, I did not miss this dark comedy, which was a finalist for the 2012 Pulitzer Prize for Drama. 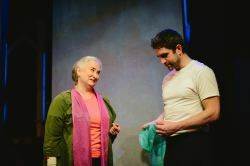 Sons of the Prophet explores human pain and suffering, sickness and death, mixed with humor, warmth and charm. Cadence Theatre Company in partnership with the Virginia Repertory Theatre (yes, it’s a mouth full!) has brought together a cast filled with some of Richmond’s A-list actors. The main character, Joseph is a young Lebanese-American living in Nazareth, Pennsylvania. With a frustrating job, unexplained chronic pain and several crises at home; his health, sanity, and insurance premium are all on the line. He has a distant relative who has written a book called “The Prophet.” Joseph and his family are forced to face numerous tragedies that ring of the universal pain all families must face. Each must find their own way to deal with these painful realities through their own hope and faith. There are just not going to be enough superlatives to describe the performances. Each actor adds to the three dimensionality of the family dynamics. As they talk over one another, and don’t truly hear one another, it gives a feeling of watching a real family. 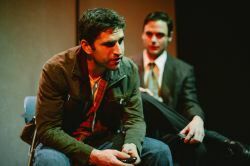 The cast truly connects on a believable level to their characters, the audience and one another. The dark humor mixes beautifully with the harsh painful reality. Ryan Bechard, as Joesph, is reminiscent of Glee’s Matthew Morrison. He displays Morrison’s charm, good looks and occasional brooding, thoughtful demeanor (like, for Glee fans, after he was left at the altar this week). He shows tremendous range and authenticity in both his emotional and physical pain. 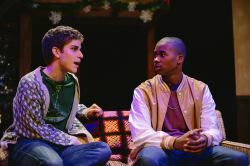 D J Cummings is equally likeable and charming as Joseph’s younger brother Charles. He is innocent and childlike, yet sarcastic and bratty. Alan Sader (as his bio says, “the guy with the beard” in the Christian Children’s Fund commercials) is grandfatherly and exudes old world charm as Uncle Bill. His character is “ethnic” but in a way that anyone could relate to him — he could be European, Jewish, or, as is the case, Lebanese-American. He also is consistent in his physicality of Bill’s disabilities. The supporting cast outside of the family each stand out in their performances as well. Melissa Johnston Price is hysterical as Joseph’s rich, deranged, neurotic and wine-loving boss Gloria. She brings great nervous energy and eccentricity to the role, without being over the top. Picture Wendie Malick aka Victoria Chase in Hot in Cleveland at her best. Evan Nasteff is also engaging and realistic as Timothy; the TV Reporter/love interest for Joseph (by the way, both Joseph and his brother Charles are gay). Rounding out the cast are Marquis Hazelwood, as Vin, the young man who causes the death of Joseph’s father; and Jacqueline Jones, Kimberly Jones-Clark in multiple roles. Each adds great comic ability and timing to their scenes. Jones and Jones-Clark are side-splittingly funny as two Midwestern soccer mom/school board members, and Jones-Clark’s Dr. Manor is Ellen DeGeneres incarnate. Hazelwood switches from hilarious nervousness and innocence to emotionally vulnerable fluidly and believably. The play is perfectly directed by Anna Johnson. I have heard stories about Cadence being legendary with their abilities to design extraordinary sets on their small stage, and Sons of the Prophet did not disappoint. Scenic Designer Terrie Powers created a multidimensional set that is functional and basic but visually spot on. Lighting Designer Brian Barker and Sound Designer Andrew Hamm help set the mood and enhance the production. Costume Designer Lynn West created outfits that fit the character and were visually appealing. The play is energetic and moves along briskly. Even the set changes are fast and smooth, with cast members doubling as set crew, yet remaining in character visually as they do it. Families beware, there is some strong sexual content and language. My only real disappointment was that the play left me wanting more. The actors and their characters were so engaging and likeable, it left me wanting to know what would happen to them next; but isn’t that the sign of a truly great play? This article can be linked to as: http://showbizradio.com/go/9210.